Sharp's upcoming Aquos S3 smartphone has been doing the rounds in the rumorverse since the beginning of this year, getting certified for sale both by China's TENAA and Taiwan's NCC. 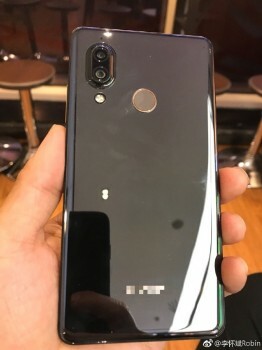 Those outings have revealed a few pictures of the handset, but if you want more a source over in China delivers today. This is our first look at hands-on images of the Aquos S3, caught somewhere in the wild with its iPhone X-inspired screen notch and dual rear camera positioning and vertical alignment. Unlike Apple's darling, this model goes with a fingerprint scanner on the back as you can see, since the Android world still isn't ready to give up on those. The Aquos S3 has a bottom bezel, but a pretty small one, and its design is quite in tune with the times. It should arrive with the Snapdragon 630 chipset at the helm, paired with 4 or 6GB of RAM and 64 or 128GB of storage, depending on which model you buy. It will reportedly boot Android 8.0 Oreo from day one. The screen is probably a 5.99" 18:9 LCD with 2,160x1,080 resolution. The rear camera module has 12 MP + 13 MP snappers, while for selfies you'll get a 16 MP sensor. Everything is kept running smoothly by a 3,100 mAh battery. The Sharp Aquos S3 may become official at MWC later this month, ahead of a possible European release at some point between April and June. Maybe Vlad should be a bit more inspired to read some facts. 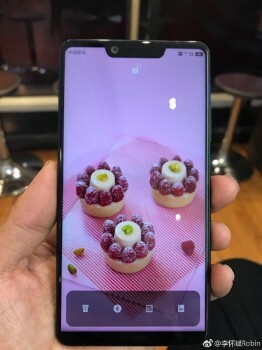 Perhaps Sharp was inspired by its own earlier model, Aquos S2, which had the notch and which was already out in the market when iPhone X was only merely announced. Honestly I think Sharp is losing their edge already.